NAD Electronics, a company with over three decades of experience who has long been known under their acronym from the company's name New Acoustic Dimension, has launched their Masters Series M15HD surround sound preamplifier ($4499). This powerful and versatile component is designed to serve as the "brains" of any stereo or surround sound system and offers the flexibility if NAD's MDC (Modular Design Construction) in addition to innovative circuit designs, proprietary operating software, broadcast-quality image processing and exceptional sonic performance. Its "Music First" performance design allows the space, scale, and transparency encoded in the directional sounds of Dolby and DTS surround soundtracks to push the boundaries of a listening room. An array of additional features further enhances the M15HD including four HDMI 1.3 repeaters, a tape monitor, lip sync compensation (option to 100mS), flexible bass management, and individual crossover frequencies for front, center, and surround speakers. Also aboard are four dual differential 24-bit, 192-kHz digital-to-analog converters, Dynamic Headroom Scaling for optimum resolution, an S/N ratio for all program and decoding combinations, digital tone controls with a center channel "dialog" setting, and an extensive package of connections. Also provided are separate power supplies for digital and analog sections of the M15 HD, a custom designed Switch Mode, and a Linear Power Supply with a custom 'Figure 8' transformer. The cornerstones of MDC are easily removable A/V modules that include the circuitry for digital audio and HDMI functions, component and analog video functions, and two-channel and multi-channel analog audio functions, plus all the inputs and outputs needed for full connectivity. The modules for the M15HD come packed with advanced features that include dual 32-bit Aureus 7.1 high-speed DSPs by Texas Instruments; Dynamic EQ, Dynamic Volume, and MultEQ Pro room correction technologies by Audyssey; decoding for advanced audio formats, including Dolby True HD, Dolby Digital Plus and DTS-HD Master Audio; and Sigma Designs' VXP broadcast-quality image processor. Enjoy the Music.com has reviewed the NAD T763 surround sound receiver (click here), their L53 DVD receiver (click here), and NAD's PP1 phonostage (click here). Just in time for their 10th anniversary, ADAM Professional Audio has announces a new top-line of studio monitors. The new SX-Series is based on the highly acclaimed S-Series. However, it is not a simple revision of existing models but a fundamental transformation with no details having been overlooked and every sound crucial aspect has been evaluated. All transducers, drivers and electronics have been redesigned. The result is much more than an improvement; it is a quantum leap in professional monitoring. All six models (S1X, S2X, S3X-H, S3X-V, S4X-H and S4X-V) feature the new X-ART (eXtended frequency response) tweeter as pictured here. Its fundamental principle of accelerating air is the very same as the proprietary Accelerating Ribbon Technology but with a 4dB higher efficiency, a 3dB higher maximum sound pressure level, and an increase in frequency response up to 50 kHz. Also, ADAM designed a completely new broadband amplifier to perfectly match the X-ART tweeter. The A/B amp shows ultra low distortion figures together with an excellent damping factor. An internal bandwidth of more than 1 MHz is externally limited so that the unit delivers an ultra wide response up to 300 kHz. With nothing limiting the talents of the X-ART tweeter, the monitor has unsurpassed clarity and openness, which will please, amaze and thrill even the most experienced professional ear. The HexaConeT-woofer used exclusively is ADAM monitors have also been redesigned with larger and longer voice coils that deliver more linear excursion for higher SPL max. values. A stronger magnetic structure is added as well for an optimum in efficiency and accuracy. Last but not least, ADAM has developed a new, innovative front panel with sophisticated controls. These controls allow the user to adapt the speakers to the sound room with high precision. The panel can be found on the models S2X, S3X-H and S3X-V as well as S4X-H and S4X-V. All SX-models (except the S1X) can be optionally retrofitted with a 24-bit/192kHz D/A Converter featuring an AES/EBU (XLR) and a S/PDIF (RCA) inputs as well as a R/L/Mono switch. Enjoy the Music.com has reviewed the Adam A5 recording studio monitor, which can be seen by clicking here. 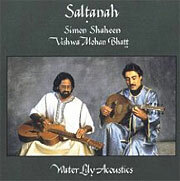 HDtracks, founded by David and Norman Chesky of the audiophile-record label Chesky Records and offers high-quality music download service with a diverse catalog of independent music from around the world, is now featuring a recording by Grammy-winning Vishwa Mohan Bhatt and Simon Shaheen titled Saltanah. This world/fusion recording was recorded by the critically acclaimed label Water Lily Acoustics for SACD release and is a historic collaboration. It brings together musicians of the Hindustani and Arab traditions. Bhatt has already reaped a Grammy and the undying support of legions of new fans as a result of the great genre-defying ventures that he has undertaken over the last several years. He is joined in this cross-pollination by oud and fiddle master Shaheen who is equally adept at both traditional Arabic styles and Western classical music. Marantz America, a world leader in advanced home entertainment solutions, is introducing three new audio/video receivers geared to meet specific user needs and expand the realm of possibilities in 21st century stereo and home theater enjoyment. Marantz's new A/V receiver offerings include two Bluetooth-capable models, the SR6004 and SR5004 as well as the new slimline Model NR1501 ($1250, $850 and $600 respectively). Both the Marantz SR6004 and SR5004 are Bluetooth capable home theater receivers, designed to work in conjunction with Marantz' new RX101 Bluetooth receiver ($130). The RX101, which is powered by the receiver, is included with the purchase of the SR6004 and may be purchased separately for use with the SR5004. The RX101 works by receiving audio signals from Bluetooth-enabled devices (PDAs, PCs as entertainment devices, etc.) and sending them directly to the connected receiver, allowing users to enjoy great sound and more flexibility from their home entertainment sources. Users may listen to streaming audio from their Bluetooth-enabled cell phones, mp3 players, computers or other devices, including the iPhone and iPod Touch. Several innovative advancements distinguish Marantz's new receivers from competitors; for example with its 4-In/2-Out HDMI Repeating capability, the SR6004 allows users to connect two separate displays and switch from one to the other without changing cables. In addition, the SR6004 features a front-panel USB input that is compatible with the iPod and iPhone, supports playback of mp3, WMA and WAV files plus provides playback control via remote (Play, Stop, FF, BWD, Skip Forward, Random and Repeat Play). The graphic user interface shows music track information on the unit. Both models feature advanced processing and sonic enhancement technologies to ensure a superior listening experience and compatibility with today's highest quality sound formats. For example, both support HBR Audio with advanced HBR (High Bit Rate) Audio Decoding, as well as Dolby Pro Logic llz, Dolby True HD, and dts HD decoding. They also feature a full 10-bit video processor that supports an I/P converter for video scaling to 1080p from all analog sources as well as the transcoding of analog signals to HDMI. The Marantz NR1501's slimline chassis unit at a mere 4 high and 13 (inches) deep. It features four HDMI 1.3 inputs for maximum performance from all today's most advanced video sources plus a full complement of built-in audio codecs ensures compatibility with advanced audio formats such as Dolby TrueHD and DTS Master Audio. For added convenience and flexibility, a front panel 3.5mm connector lets users connect their iPods or other portable devices. The on-screen display menu simplifies system setup and a full-function Glo-key remote includes preset codes for Marantz Blu-ray players so users can operate the heart of your system without searching for another remote. Enjoy the Music.com has reviewed the Marantz CD5001 CD player (click here) and SA8003 SACD player (click here). Klipsch has developed their new Klipsch Reference Series which uses even more advanced driver and materials technology than their highly acclaimed Synergy line! This new series offers consumers very high quality speakers, yet at very affordable prices. Mark Kauffman, senior product manager, says "We have stayed true to the Klipsch design philosophy and achieved a more complete design by utilizing sophisticated materials and incorporating advanced electronics... We’ve always had a performance edge, but now with the Reference Series we’ve moved further ahead in offering incredible performance and value. We have maintained our traditional ‘up-front, close to the soundstage’ musical intimacy, expanded the soundstage, and added a holographic 3D image. Audiophiles need to pay attention to Reference because their old ideas of Klipsch are going to be shaken." According to their press release "Advanced Reference Series driver and materials technologies include a 90° x 60° Tractrix Horns, titanium tweeter diaphragms, copper-colored anodized aluminum cones, glass-filled, vented, cast-polymer woofer frames, large magnets and high-precision solid pole pieces. The crossover features air core inductors and film-type capacitors, bi-wire crossover networks while the MDF enclosures with computer-optimized bracing and low restriction ports, with tapered-array center channel. Similar to the approach of the Klipsch Synergy Series, Reference systems utilize advanced technologies in every speaker for a smoother response and more consistent coverage pattern. For example, each speaker is equipped with a Tractrix Horn, contributing to the system’s excellent imaging. Reference systems, however, take the approach considerably further by delivering the advanced technologies through new higher-grade materials and electronics. The resulting family of products reproduces extended, tight, bass, and extremely clear mid-range and high frequencies that go well beyond the limit of human hearing." The Reference Series consists of the RP-3 and RP-5 which are claimed to "deliver more content and better performance at price points that are as low as half the cost of competitive models". The new Klipsch RP-5 and RP-3 are floor standing units with front firing mids and highs, yet with side firing self-powered subwoofers. The RP-3 uses a 1-inch horn tweeter and 6.5-inch midbass and a side-firing self-powered 10-inch woofer. The RP-5 uses the same tweeter, yet with an 8-inch midbass and a single 12-inch side-firing self-powered subwoofer. The 1999 Klipsch Reference Series products retail at RP-5, $2,000/pr and RP-3, $1,500/pr. Enjoy the Music.com has reviewed the Klipsch Reference RP-5 floorstanding loudspeakers, which can be seen by clicking here. Bryston, legendary for their hand-assembled build quality, performance and reliability in both the pro audio and consumer audio market, has announced that the first two of four new 8-channel zone amplifiers will be available in October 2009. The Bryston D-Series D-130Z Hybrid and the D-250Z Hybrid ($4,95 and $5695 respectively) have been in development and many dealers have expressed the need for a lightweight, high performance multi-channel amplifier for distributed audio and industrial applications. Bryston uses the term "Hybrid" in reference to the combination of Class D amplifier technology along with a Bryston engineered linear power supply design. The D-130Z features dual 650 watt linear power supplies to handle 8 independent channels at 130 watts each into 4 Ohms (90 watts at 8 Ohms). The unit is configured so that there are four stereo zones and each individual zone bridgeable to 400 watts into 8 Ohms. A level control is available on each channel and each channel can select direct input (RCA), left bus only, right bus only or L+R (mono). Each zone can be muted independently with 12-volt trigger. On the rear of the unit are gold plated five-way speaker binding posts and each unit includes a five year warranty. The Bryston D-250Z Hybrid features dual 850 watt linear power supplies to handle eight independent channels at 250 watts each into 4 Ohms (150 watts at 8 Ohms). All the other features from the 130Z carry over as well. Enjoy the Music.com offered a World premiere review of their new Bryston 7B SST2 C-Series monoblock power amplifier, which can be seen by clicking here. Naim Audio, an England-based company with over 35 years of passionate and committed in music reproduction, has officially launched their Zero S/PDIF Jitter DAC ($3500). The Naim DAC is the world's first Apple authenticated high-end DAC, which means it can connect digitally to any iPod or iPhone and take the output digitally of anything that would have been sent to the headphone output. This includes UPnP streaming, the thousands of internet radio stations available via apps on the iPhone or iPod Touch and all the music stored on any iPod. While the Naim DAC has passed all internal and first stage Apple approvals, Naim expects final approval in two to three weeks and easily works with iPod generation 5 and onward. The new Naim DAC is a high performance zero S/PDIF jitter digital to analogue converter that also allows for upgradeable power supply, includes eight S/PDIF inputs (two BNC, two RCA and four Toslink). In addition, the Naim DAC includes a USB (Type A socket) on the front and rear panels, which facilitate USB memory stick playback and fully authenticated digital connection from an iPhone or iPod. Naim feels that key points is the way in the Naim DAC's master clock is not recovered from the S/PDIF signal as in other DACs. Instead, the incoming audio data from S/PDIF is stored in solid-state memory and then clocked back out to the DAC chips using a fixed-frequency local master clock. This is said to eliminate jitter caused by S/PDIF. In essence the memory, master clock and DAC structure behaves in a similar manner to the CD, master clock and DAC structure of a CD player. The Naim DAC's high-speed DSP (digital signal processor) front-end is electrically isolated from its high-resolution DAC and analogue circuits. The two sections are also run from separate power supplies significantly reducing the effect of RF noise (S/PDIF is a source of RF noise) from the S/PDIF circuitry on the DAC stage. Digital filtering is handled by an extremely powerful SHARC DSP chip running unique Naim authored code to create an ultra high precision 40-bit floating point filter. The filter over-samples by 16 times on 44.1 kHz data and provides stop-band attenuation of 156dB with virtually no pass band ripple. Following the digital filter are the DAC's two mono Burr-Brown PCM 1704 digital to analogue converters. The unit can be controlled via included remote or by the Apple remote and is field firmware upgradeable. Sample rates the unit can decode include 32 to 768 kHz at 24-bit for the USB, 32 to 192 kHz at 24-bit for S/PDIF and 48 kHz maximum for the iPod/iPhone. Enjoy the Music.com has reviewed the Naim X series system, which includes the CD-5x CD player, NAC-122x remote preamplifier, Stageline phono preamplifier, NAP-150x power amplifier and Flatcap 2x power supply, and it can be seen at this link. Enjoy the Music.com has a world premiere of Hi-Fi World's Volume 19 Number 8 (October 2009) including the compete editorial and table of contents. This issue includes reviews of the Triangle Quartet tower loudspeaker, the Wharfedale Diamond, Electrocompaniet EC4.8 preamplifier, DCS Pagnini DAC, Naim CD5 XS digital disc player, a group test of six of the best sub-£2,000 integrated amplifiers... and much more! The editorial by David Price says, "It's shocking to think that Compact Disc will soon be thirty years old, and all the more curious that it's still, in the absence of anything else, the de facto music carrier of our time. Still, when a product like the dCS Paganini DAC [see p26] comes along, suddenly I am more comfortable with digital audio. The dCS shows that, given fiendishly clever design, very decent performance can be coaxed from the creaky old 16/44 format." To see the entire table of contents and read the complete editorial click here. Wadia Digital, founded in 1988 as a high-end audiophile company dedicated to the development of digital audio products, has announced their 151 PowerDAC mini ($1195). To complement the company's 170iTransport, Wadia has developed new technologies that enables the Wadia 151 to hold all of the conceptual purity of the original Reference PowerDAC and reduces these elements to their most cost effective form. The 151 PowerDAC mini measures just 2 x 8 x 8 (HxWxD in inches) and incorporates two S/PDIF digital coax inputs, one Toslink input and one USB input for easy connection with most computers and digital sources. Rated at 50 watts (4 Ohms), it has the power to drive many currently available speakers. With an LED Backlit Display, volume control, mute, phase and input buttons on its face and an IR remote control; the 151 is elegant in its simplicity. Wadia Digital's 151 PowerDAC mini will be shipping in black and silver finishes in Fall 2009. Exposure's new EXP03 handheld wireless iPod Dock ($399) allows for wireless iPod docking and will stream music wirelessly from an Apple iPod to your stereo. The EXP03 features a handheld cradle that transmits music wirelessly using Bluetooth A2DP to a base station receiver, which users connect to their stereo via RCA cables. The rechargeable unit can be operated for up to 8 hours, after which it needs to be recharged by sliding the handheld cradle with iPod still inserted into the docking slot on the base station. Both the cradle transmitter and the iPod will be charged at the same time. During recharging users can still listen to music. A mini-jack socket on the handheld cradle allows streaming of mp3 players, PDAs, PCs, laptops, cell phones and other devices. Enjoy the Music.com now offers a sneak peek at the September 2009 edition of The Absolute Sound (Issue 195) featuring the complete table of contents and editorial! This edition features the all-important and prestigious 2009 Editors' Choice Awards with 42 pages of the best gear in every category at every price. Within this issue's editorial by Robert Harley titled The 2009 TAS Editors' Choice Awards: How We Choose, he writes "We start by taking last year's Editors' Choice Awards document and methodically fact-checking every listing to see if the product is still current and available for purchase, if there's been a price change, and whether the product is still handled by the same distributor. Discontinued products or those that no longer have North American distribution are automatically dropped. We next provisionally add to the list every product that's been reviewed in the intervening twelve months." You can see the table of contents and read the complete editorial by clicking here. B&W Loudspeakers, the British manufacturer recognized internationally as a leading source of loudspeaker technology, has added a new subwoofer, the ASW 12CM ($2000) to their successful CM Series. Comprised of two bookshelf speakers, two floor standing models, two center channels, and two subwoofers, the CM series delivers a wide range of system options and performance plus value. The ASW 12CM is similar in design to the ASW 10CM, but features a 12-inch Kevlar/paper cone with a long-throw driver in a larger enclosure with a higher power amplifier. This allows the unit to produce deeper bass and higher output capability. The voice coil utilizes a large 3-inch assembly to easily accommodate the high internal temperatures associated with high output. Meanwhile the dual suspension maintains cone alignment and lowers distortion. The driver chassis is a rigid diecast metal to prevent flexing under stress and further lower distortion. The ASW 12CM amplifier delivers 500 watts of Class D power while the internal crossover incorporates a three-position switch to tune the subwoofer for the best in-room performance. Frequency response is from 25 Hz to 140 Hz (±3dB, adjustable). Functions include inputs via line level (RCA) or speaker wire, low-pass filter, bass extension, bass roll-off alignment, phase switch and an auto-sense on/standby. Dimensions are 12.8 x 12.8 x 14.3 (HxWxD in inches) and each unit weighs 34.4 lbs. 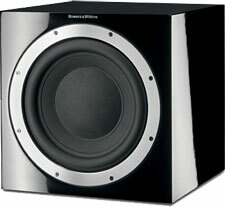 Enjoy the Music.com has reviewed the Bowers & Wilkins 800D full range floorstanding loudspeaker (click here). President of Hachette Filipacchi Magazine's new media division, Jim Doucherty, has quit his position with the company over disagreement on strategy with Hachette's new CEO, Jack Kliger. Doucherty has been at Hachette for almost eleven years. Doucherty said "He's got perhaps a different vision for new media than what we've been running under for the last three years. I don't know that he values new media as a stand-alone property. Instead of a stand-alone profit center, Jack is going to want to use it to leverage the magazines... Jack has a very powerful initiative now for Hachette that has to do with circulation. I think that some of what happens with those sites now will also be to use this division as support for the magazines." A source undisclosed told even more details and said "It's the inevitable result of having two power centers at these companies. The publishers have a lot of jealousy and resentment. They look at the online group and say, 'These guys are taking my brand and making money off of it.' Even though they don't know anything about new media, they think it's something that's part of their brand." So it seems that online magazines are again becoming a very hot topic as print media looks for their place on the web. Hachette Filipacchi magazines include Audio, Car and Driver, Car Stereo Review, Road and Track, Stereo Review's Sound & Vision and Woman's Day to name a few. Fast-forwarding to 2009 we note that Audio magazine is no longer publishing, Car Stereo Review seem to be gone and Sound & Vision is owned by Bonnier. * Output section risetime: 600V/micro-sec. * THD: typically under .5% with proper setup. * Power Supply Storage: 1200 Joules in output section, 100 Joules in Driver supply. * Tube complement: 20 6AS7 output tubes and 6 6SN7 driver tubes. More specifications from their entire line is available from their website. Enjoy the Music.com has reviewed the Atma-Sphere MP-3 by Todd Warnke (click here), the MP-3 as review by Wayne Donnelly (click here) and the Atma-Sphere M-60 Mk.II.2 OTL monoblock amplifiers (click here). Red Wine Audio has unveiled their first audiophile-class battery powered headphone amplifier and DAC combination. 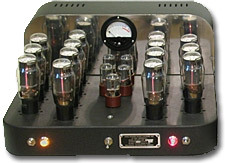 The Isabellina HPA integrated ($2500 including remote control) that combines the company's Isabellina DAC with the headphone stage originally developed for their Isabella vacuum-tube preamplifier. Features include premium Vcap capacitors, ultra-short signal and power paths, plus a very low impedance output driver stage. 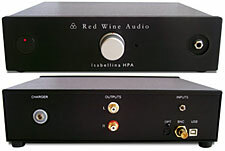 HPA includes a full-featured Isabellina DAC, including RCA output jacks and supports three types of digital inputs including USB Toslink (optical), Coax or USB. For those only designing the Isabellina DAC without headphone stage, the price starts at $1500. Enjoy the Music.com is offering a world's first sneak peek of Musical Laboratory* finalized version of the new Maedup monoblock amplifier ($5200 per pair). Like the company's Bosangwha monoblocks, these power amplifiers are based on the classic and legendary sounding LM3875. However, the design brief for this amplifier was to introduce into the sound a warmth and bloom normally associated with tube designs while still retaining the dynamics and transparency of the chip. The Maedup monoblocks use an external power supply and the amplifiers come in high-gloss lacquered boxes. Colors available are black with zen purple highlights and purple macramé knots or black with red highlights with red macramé knots (pictured), with black with black macramé knots becoming available soon. Enjoy the Music.com provided a world premiere review of the Musical Laboratory*'s Paeonia Rev. 2.3 passive preamplifier and Bosangwha Rev.2.3 monoblock amplifiers, which can be seen by clicking here. Morel's new Octave Signature speakers provides "better-than-ever sound engineering" plus a user-empowering modular cabinet design. Morel's modular cabinet concept provides the listener with new building-block expandability options that allow easy whole system upgrading. Now the user who starts solo with the stylish, high-performance, Octave Signature Bookshelf speakers for stereo sound can decide when to step up to the home theater experience by adding matching subwoofers. The vertically designed subwoofers fit beautifully beneath the bookshelf monitors transforming them into floor-standing units. Designed and built in Israel, Morel's latest improvements to the Octave Signature benefits from design techniques first seen in their reference Fat Lady loudspeakers, including the highly unusual concept of allowing the enclosure to vibrate with the music. By adopting an entirely empty cabinet with strategically placed partitions and no internal damping whatsoever this new version provides an astonishing listening experience that delivers pure deep bass and a massive soundstage with vibrant "live-like" performance at all volume levels. New drivers work with Morel's external voice coil (EVC) technology utilizing huge Hexatech aluminum coils, powerful and compact neodymium and hybrid magnet motors and hand-coated Acuflex silk-dome tweeters. 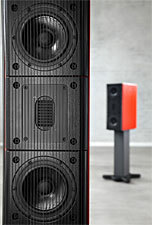 Enjoy the Music.com has reviewed the Morel Octave 5.2M loudspeakers as seen here. According to The NPD Group, a leading market research company, while CDs remain the most popular format for paid music purchases, digital music sales are making up an ever-greater share of United States music sales. CDs comprised 65 percent of all music sold in the first half of 2009 compared to paid digital downloads, which comprised 35 percent of music sales. By comparison, paid digital music downloads comprised just 20 percent of sales in 2007, thus growing to 30 percent of the music market last year. "Many people are surprised that the CD is still the dominant music delivery format, given the attention to digital music and the shrinking retail footprint for physical products," said Russ Crupnick, vice president of entertainment industry analysis "But with digital music sales growing at 15 to 20 percent, and CDs falling by an equal proportion, digital music sales will nearly equal CD sales by the end of 2010." According to NPD MusicWatch, when it comes to the unit-sales volume of music sold at retail, including paid digital music downloads and CDs, Apple iTunes leads in the United States with 25 percent of music units sold. This is up from 21 percent in 2008 and 14 percent in 2007. Wal-Mart (including Wal-Mart, Walmart.com, Wal-Mart Music Downloads) remains in second position with 14 percent of music volume sold at their stores and Web sites with Best Buy ranked third. iTunes also continued to solidify its lead in the digital music arena, as consumer downloads from iTunes comprised 69 percent of the digital music market in the first half of 2009, followed by AmazonMP3 at 8 percent. Wal-Mart leads all sellers of CDs with a 20 percent share of the physical music market, followed by Best Buy at 16 percent and Target and Amazon tied at 10 percent each. Linn, a high-end audio company established in 1972 by Ivor Tiefenbrun that has received many awards from leading magazines, now offers new software for their DS (Digital Stream) players. The new Linn DS software takes digital streaming to the next level with simple drag and drop user interface, improved integration with iTunes music library, quick and easy access to online listening sources, a web-based configuration makes system set-up more simple. This free software download is for all Linn DS owners. A new, simple and fun user interface, KinskyDesktop, provides a Linn control solution that lets Linn DS owners browse their music by Album Cover Art, save playlists on their individual computers for later use and listen to new content including iTunes music files (AAC and ALAC) and radio podcasts. A new plug-in feature provides an easy method of browsing and downloading new sources of content online as they become available, such as BBC radio podcasts and internet radio. KinskyDesktop also lets owners play all of their music for as long as they like in a random order using the 'shuffle' function, whilst KinskyJukebox lets them pre-set their favorite songs, artists, genres or radio stations by specific numbers for a quick, personalized method of selection. The new web-based configuration makes setting up the Linn DS system easier than ever, letting you configure your Linn DS from any browser on the network. 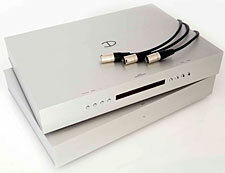 A wide range of Linn DS Players are available including the Klimax DS, Akurate DS, Majik DS and Sneaky Music DS. Enjoy the Music.com has reviewed the Linn Classik integrated amplifier with the Kan loudspeaker (click here) and Linn's Katan monitor loudspeakers with their Sizmik 10.25 powered subwoofer (click here). Channel D's has now shipping their Seta Nano phono preamplifier ($1599) that works in conjunction with the company's Pure Vinyl RIAA correction and recording/ripping software for the Macintosh computer. The new Seta Nano also includes independent, RIAA corrected outputs for those audiophiles insisting on an all-analog signal monitoring path. The flat and RIAA outputs may be used simultaneously, for the very best of both the analog and digital worlds. The balanced, ultra wide bandwidth (> 9 MHz) design employs extremely little negative feedback and only where absolutely needed according to the company. Features include low distortion, direct coupling, fully balanced circuitry, cartridge loading adjustments and balance (±2dB). There is also selectable RIAA or Neumann modified (50 kHz shelving) correction curve. Voltage gain is 47 dB, flat outputs; 60 dB RIAA corrected outputs and a bandwidth from DC to 9 MHz (-3dB). RIAA accuracy is better than ± 0.1 dB from 20 Hz to 20 kHz with a channel balance better than ± 0.02 dB and separation of > 90 dB. 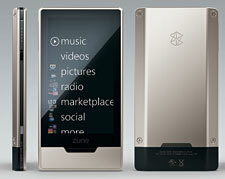 Microsoft Corporation is now offering preorders of their evolution of the Zune portable audio/video device, dubbed the Zune HD. This is the first small portable audio device that can handle high-resolution audio that audiophiles all around the world are now using and uses a solid-state hard drive, with availability being a 16GB and 32GB units ($219 and $289 respectively). Due to the Zune HD's XBox LIVE awareness, available also in the fall for International customers, this marks an important development in the Zune strategy and brings the Zune brand to more than 17 million international Xbox LIVE subscribers. Features include built-in HD Radio receiver, HD video output capabilities and web browser with Wi-Fi connection. 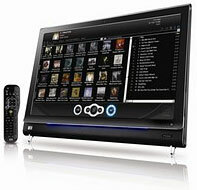 HD video playback is available via a premium HDMI A/V docking station (sold separately) directly to an HDTV in 720p. The OLED touch screen is 3.3 inches and allows users to easily flip through music, movies and other content. The Microsoft Zune HD is the first unit to employ the NVIDIA Tegra chip, which is an ultralow-power HD processor that handles NVIDIA PureVideo for playback of H.264, WMV/VC-1 and MPEG-4 HD plus SD videos with minimal CPU usage. If you plan to order one, help support Enjoy the Music.com and use the below links to preorder your unit. Canada's Salon Son & Image, the country's largest consumer electronics show, is moving to a new location. The Montreal-based show is scheduled to be held from March 25 through 28, 2010 at the Hilton Montreal Bonaventure. A beautiful exterior garden surrounds a unique penthouse-style hotel having guest rooms all on the same floor, allowing visitors to easily find their way while eliminating wasted time in elevators. The rooms, with windows that open to the outside, will certainly be more comfortable to exhibitors and visitors alike. The long corridors of the Bonaventure Hilton allows the show to distribute exhibitor rooms over a greater area in an intelligent way in hopes of reducing noise between neighboring suites when the doors of the rooms remain open. The layout allows each room and each hall to be a prime location. Visitors will save significant time moving around, without missing a single exhibitor. Of important note is that the SSI dates overlap those of the 150,000-visitor National Home Show which will be taking place at Place Bonaventure, so high-end audio exhibitors can take advantage of this traffic to attract new visitors. Stereovox Reference XV-Ultra digital cable ($350) is a highly electrically precise 75 Ohm cable made with Mil-Spec silver-plated copper solid core conductor. A precision applied low-density cold-process air articulated Teflon, metal foil and woven shields surround the core of this cable and is said to emulate the exacting electrical environment of "semi-rigid" microwave cables. They have also implemented long-cycle cryogenic treatment not only to the raw cable itself, but also to all the connectors and adapters. This is claimed to have the effect of altering the temper of the crystal lattice matrices in all of the metals used to create the cable. Finally, Stereovox incorporated an RF absorbing layer of pure woven carbon fiber, and an overall jacket that expresses minimal dielectric effect. Enjoy the Music.com has reviewed the Stereovox LSP-600 and HDXV cables (click here) and XV2 digital and video interconnect (click here). 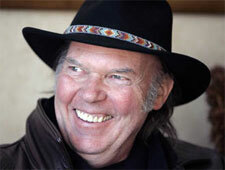 The Recording Academy, same folks who bring us the Grammy Awards, has chosen Neil Young as their MusiCares 2010 Person of the Year during their 20th anniversary gala in Los Angles to be held January 29th. Proceeds from the annual Grammy Week gala dinner and concert honoring Neil Young will provide essential support for MusiCares, which ensures that music people have a place to turn to in times of financial, medical and personal need. The singer, songwriter and performer is being honored as the MusiCares Person of the Year in recognition of his influential artistic accomplishments as well as his philanthropic work, which has included many generous charitable activities over the years. Throughout his career, Neil has stood out as an exceptionally talented performer, and he has stood for causes that are both noble and close to his heart. The 2010 MusiCares Person of the Year gala will begin with a reception and silent auction offering an exclusive and unparalleled selection of luxury items, VIP experiences and one-of-a-kind celebrity memorabilia for bidding guests. The reception and silent auction will be followed by a dinner, the award presentation and a star-studded tribute concert. The MusiCares Person of the Year tribute ceremony, co-chaired by Warner Bros. Records Chairman Emeritus Mo Ostin, Lookout Management President and Founder Elliot Roberts and Warner Bros. Records Chairman/CEO Tom Whalley, is one of the most prestigious events held during Grammy Week. The celebration culminates with the 52nd annual Grammy Awards on Jan. 31, 2010, at Staples Center in Los Angeles. The telecast will be broadcast live on the CBS Television Network at 8 pm. Over the years, Enjoy the Music.com has freely given to MusiCares and has reported on the Grammy awards. Panamax/Furman, an international leader in providing innovative power management products for more than 35 years, is soon going to introduce their BlueBOLT series of power units. This new technology provides secure, hosted IP (Internet Protocol) system control over compatible Panamax and Furman products. BlueBOLT has an easy to use graphical user interface that allows installers to monitor multiple installations across multiple locations. Users simply connect any Panamax or Furman product equipped with a BlueBOLT IP communications card to the Internet and the unit will find its home server and be ready to use with minimal configuration. BlueBOLT allows individual outlets or outlet banks to be power-cycled from any Web browser or Web-enabled mobile devices. With BlueBOLT, voltage and current consumption can be monitored in real time or tracked over a time period. E-mail notifications are sent when power anomalies are detected, allowing installers and end users to take immediate action in the event of a catastrophic surge, brownout, blackout, or other power event. BlueBOLT also provides a simple and convenient way to manage energy consumption by cutting off all current to select components, thereby eliminating wasteful stand-by power in an A/V system. BlueBOLT technology will be available via an add-on card compatible with select Panamax and Furman products. Also new from Panamax/Furman is their MX5102 ($650), the company's first product to combine power management features such as linear filtration and surge protection with battery back-up all in a single hybrid component. Available as a standalone product or as part of a rackmount solution, the unit's front panel offers an LCD status display that shows the incoming line voltage as well as battery run time remaining in case of a temporary power failure. The hybrid MX5102 provides UPS functionality via two of its 10 outlets, while still providing common power management features such as high-current outlets and 12V triggering to the switched outlet banks. Other new units include the MB1500 ($1300) features a 12A capacity with 1500VA battery back-up, while including surge protection, automatic voltage regulation, and Linear Filtering Technology (LiFT). Remote or local IP control is an available option through Panamax's new BlueBOLTT technology, which allows the MB1500 to be managed either remotely or integrated into a home network. An optional 2-RU 1500VA battery extension pack (BATT1500-EXT) is also available to double the battery life of the unit. The new MB1000 ($730) includes a battery back-up system and automatic voltage regulation prevent sensitive home equipment from locking up due to power sags or temporary black outs, while keeping connected components from overheating and/or experiencing premature failure. A standard RS-232 serial communication port provides communication between the MB1000 and a home theater controller, HTPC (home theater personal computer), or home automation system. The small MB850 ($300) is a compact hybrid UPS weighing only 16 pounds and has voltage regulation with entry-level back-up solution for remotely located A/V equipment or space and weight constraints, where the unit can be placed close to the equipment. Enjoy the Music.com has reviewed the Furman Sound IT-Reference and 1220 balanced power units (click here). Aperion Audio, a consumer direct maker of award-winning home theater speaker systems, has added their first ever outdoor speaker. The Aperion Intimus Outdoor Speaker ($149) was developed to meet customer requests for an outdoor audio solution that provides a similar value as the existing Aperion home audio speaker line. Combining an audiophile grade tweeter and woofer with a rugged weather and UV-resistant cabinet, the Aperion Intimus Outdoor Speaker features a bass adjustment switch, an aimable mounting system and is voice matched to the entire line of acclaimed Aperion Intimus speakers. A 1-inch audiophile-grade silk-dome tweeter is mated with a 6.5-inch dual voice coil woven-fiberglass woofer. The unit is available in Alpine White or Satin Black and comes with a ten year warranty. "Our goal was to create an outdoor speaker that comes as close as technically possible to the performance of our bookshelf speakers, one that would resist the elements and provide years of reliable use while not compromising on sound quality -- and I believe we've achieved that," said Mike Hopkins, Aperion Product Development Manager. Enjoy the Music.com has reviewed the Aperion Audio Intimus 4B monitor speakers (click here), the 6T floorstanding loudspeakers (click here) and the Intimus 5B (click here). Retro Video: How Vinyl Records Are Made. How tubes are made and how they work. See the August 2009 midmonth Review Magazine by clicking here. Les Paul, born in Wisconsin in 1915 and is an acclaimed guitar player, entertainer and inventor, passed away at age 94 from complications of severe pneumonia at White Plains Hospital in New York. He was surrounded by family and loved one, who express their heartfelt thanks for the thoughts and prayers from his dear friends and fans. As perhaps the foremost influence on 20th century sound, via the Les Paul guitar, his career in music and invention spans from the 1930s to the present. Les Paul is best known as an early innovator in the development of the solid body guitar. His groundbreaking design would become the template for Gibson's best-selling electric, the Les Paul model, introduced in 1952. Today, countless musical legends still consider Paul's iconic guitar unmatched in sound and prowess. Among Paul's most enduring contributions are those in the technological realm, including ingenious developments in multi-track recording, guitar effects, and the mechanics of sound in general. 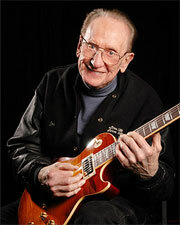 Frankly, Les Paul's accomplishments are too numerous to mention here, though can easily be found on various websites. The family asks that in lieu of flowers, donations be made to the Les Paul Foundation, 236 West 30th Street, 7th Floor, New York, New York 10001. Enjoy the Music.com now has the April to June preview of HIFICRITIC's Volume 3 Number 2 online that includes the compete editorial, table of contents and a review of the AktiMate Mini. This issue includes reviews of the Meridian's DSP 7200 speaker, moving house and hi-fi system many times, Paul Messenger describes KEF's exciting new Project Blade, the Wilson Audio MAXX Series 3, six DACs and four integrated amplifier... plus much more! The editorial by Paul Messenger says, "It's interesting to look back and notice how much our hi-fi magazines have changed over time. When I got my first job on a hi-fi magazine, as Features Editor on Hi-Fi News & Record Review quality. One could suggest that the Hi-Fi News of the time had got stuck in its hobbyist past, and not really come to terms with hi-fi's transition to a consumer mass market which had started in the early 1970s. Since its birth in 1956, Hi-Fi News had had the hi-fi scene to itself, but rivals started appearing in the late-1960s, and the goalposts started moving." To see the entire table of contents plus read the complete editorial and review of the AtkiMate click here. Audioengine, a company that designs and constructs hand-built speakers at factory-direct prices, has released their P4 premium passive bookshelf speakers ($249 in gloss white or black, $325 in Caramel (carbonized solid bamboo). The Audioengine P4 is a high-performance bookshelf speaker, though purely passive unlike the company's other speaker offerings that include built-in amplification. 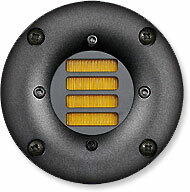 This magnetically-shielded two-way design uses a 0.75-inch silk dome tweeters and 4-inch Kevlar woofer per unit. On the back of the unit are a pair of five-way gold-plated binding posts and the Audioengine P4 can be wall mounted or be placed on a stand or shelf. Sensitivity is 88dB/W/m, frequency response is from 58 Hz to 22 kHz with a nominal impedance of 4 to 8 Ohms. Each unit weighs 6 lbs an dimensions are 9 x 5.5 x 6.5 (HxWxD in inches). Enjoy the Music.com has reviewed the Audioengine A2 powered minimonitor (click here), the larger A5 powered monitor (click here) and W1 wireless audio adapter (click here). 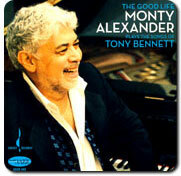 HDtracks, founded by multi-Grammy-nominated jazz and classical composer David Chesky with his brother Norman, now offers Monty Alexander's The Good Life, where Monty Alexander plays the songs of Tony Bennett. With Monty Alexander on piano joined by Lorin Cohen on bass and George Fludas on drums, the track list includes "Put on a Happy Face", "Once Upon a Time", "That Old Devil Moon", "The Good Life" and much more. Jamaica-born Monty Alexander grew up singing in church and playing calypsos and boogie-woogie by ear on the piano. His influences have included church hymns, steel drums and calypsos from Trinidad, American jazz and blues, and The Great American Songbook. After moving to Florida in 1961, Monty met Frank Sinatra, who introduced him to Manhattan club owner Jilly Rizzo. Eventually, Monty began playing at Jilly's and recorded Echoes of Jilly after Rizzo's death in 1992. He began to play professionally with his own trio in Miami in 1962 and began to tour internationally in 1974. HDtracks provides downloads for a superior listening experience in purity, tone, and expression, presenting uncompressed, CD and DVD-Audio quality recordings with complete PDF liner notes. Anderson Electronic, German manufacturer of Amity audio products, announced their new Amity HPA9S headphone amplifier (249€). By using surface mounted techniques (SMD), the HPA9S is available with black or silver housings and with one stereo volume control (ALPS-blue) or complete double mono with two separate volume controls. The Amity ABB-SD stereo amplifier circuitry inside the HPA9S has a 1/4-inch connector and has a 4 Ohm output impedance with less than 0.002% distortion. Power supply is +/- 12V with current output up to +/- 0.3 Ampere on 4 Ohms and impulse current up to 1 Ampere. Frequency response is flat up to 100 kHz with a slew rate greater than 1V/µsec. As a direct online seller, all products include a money back guarantee If returned inside of 2 weeks, with overseas customers being allowed 3 weeks. The Amity HPA9S comes with a 5 year warranty on all parts and labor against manufacturer defects. AudioControl, a United States designer and manufacturer of high performance audio and video components, new Maestro M3 premium theater preamplifier combines theater processing plus allows users the unique ability to extend video and audio signals over CAT-5/6 wiring via AudioControl's Active Balanced Outputs. The simple yet elegant design of the front panel on the Maestro M3 is highlighted by the refined rose gold lettering on a high gloss black front. AudioControl's tasteful cool blue display compliments this exquisite design. In addition to the numerous analog and digital inputs, the Maestro M3 has audiophile quality preamplifier outputs that provide up to 10 channels of balanced (XLR) and unbalanced (RCA) outputs. Audiophile quality components combined with state-of-the-art DA converters deployed across each channel provide maximum sound quality. A Stereo Direct mode allows for disabling of digital processing when using stereo analog sources. Among the twenty video inputs are five discrete HDMI v1.3 inputs which can accept high resolution signals (up to 1080p deep color) and route the signals to one of the dual assignable HDMI v1.3 outputs. A broadcast quality internal video scaler allows for upconverting, scaling and frame conversion of all video sources to HDMI. All of the latest Hi-Definition surround formats from Dolby and DTS are supported. The AudioControl Maestro M3 is also one of the first theater products to utilize Dolby Volume technology which provides a consistent volume level across all sources and content, and a reference-quality listening experience at any volume level. For those looking to enjoy their LP collection, a moving magnet phono input is also provided on the back panel. The Maestro M3 is highy automation friendly and can be controlled via IR, RS-232 or via IP control over an Ethernet connection. The Maestro M3 is equipped with AudioControl's Active Balanced Circuitry which provides the unique ability to extend selected video and audio signals over standard CAT-5/6 cabling. The rear panel of the Maestro M3 is equipped with several RJ-45 connectors that can extend component, composite, and even HDMI signals over the Cat-5/6 cabling to AudioControl Active Balanced receivers (sold separately). Gryphon Audio Designs' Mojo Reference loudspeaker system (12,500€ a pair without stands) draws extensively from lessons learned and technologies developed during the decade-long evolution of Gryphon's groundbreaking reference loudspeaker systems. Because of its large surface area and pleated diaphragm, the AMT high frequency driver moves a large air volume with minimal motion for lightning fast transients with flat frequency response well beyond 38 kHz, yet with negligible distortion and a virtual absence of compression. The tweeter is flanked by heavily modified 6-inch Danish midrange/bass drivers that provide larger surface area and high speed with minimal lag and overhang plus allow a narrower front to reduce baffle diffraction. Because of Mojo's extreme phase linearity, extended frequency response and fine-tuning options, it offers high accuracy. Interchangeable rear-mounted resistors allow the user to choose high frequency mild roll-off (-0.5 dB), neutral response (0 dB) or mild boost (+0.5 dB) to aid in integration within the listening room. The Gryphon Audio Mojo Reference is 20 x 42 x 52 (WxDxH in cm) and is available in a broad range of distinctive color options. Standard finish is a revolutionary new soft feel urethane paint with an inviting tactile sensation developed for Mercedes Benz luxury car dashboards and other interior surfaces. Custom finishes in semi-gloss two-pack automotive paint with a very hard surface are available. Bel Canto Design, manufacturers of analog and digital source components and amplifiers, latest achievement is their VBS (Virtual Battery Supply) said to offer all the advantages of a 12 volt lead acid battery without the lead, the acid, or the battery! With Bel Canto's 24/192 differential DAC as the source unit of a system, the new VBS power supply ensures clean and uninterrupted power that is free from your electric company's utility transformer and power grid. Every device in an audiophile's home may cause on/off spikes and dips, generate noise that is conducted through your electric wiring, etc. Bel Canto's debut of the VBS1's ($1495) power supply transformer is surrounded by common-mode and differential-mode filtering plus massive energy storage. The result is said to be an extremely quiet, well-regulated and isolated 12 Volt DC power for circuits to feed on. The VBS1 provides over 100dB of isolation and filtration starting below 100 Hz up through the audio band and beyond into the RF region. The extreme isolation and tight regulation of 100 Joules of energy storage plus high current capacity ensure the audio component may provide the utmost in transparency, dynamics, low frequency resolution and image palpability without being held back from power supply anomalies. Bel Canto owners with a DAC3 can send their unit to the company for the power supply upgrade board ($595) that brings it to the new 12 Volt DAC3VB ($2695) specification. Enjoy the Music.com has reviewed the Bel Canto S-300 compact amplifier (click here), the Bel Canto Pre3 preamplifier (click here) and the e.One Dac3 (click here). The Cable Company's 14th Annual Summer Against Hunger sale is now in full swing as 50% to 100% of the money consumers spend on their stereo in August can be put to work for humanitarian relief efforts. When you purchase our sponsors' products, the Cable Company, it's sponsoring vendors, and other CARE donors will send an amount equal to your purchase to CARE. Purchase other products from The Cable Company (and www.UsedCable.com) and an amount equal to half of your purchase goes to CARE. Here's the math: The Cable Company donates 5% of each purchase to CARE. This amount is matched by participating vendors for sales of their products. This year, for the first time, an anonymous donor will match this combined contribution from The Cable Company and it's participating vendors. When this total amount is donated to a CARE project, CARE will try to secure other donations up to the entire amount of Cable Company purchases. But if other donors cannot be found, our anonymous donor has agreed to contribute to CARE the entire remainder amount of Cable Company purchases up to $250,000. Why support CARE? In addition to CARE's important work, it is also an efficient organization. More than 90% of CARE's expended resources -- among the highest of all philanthropic organizations -- support its poverty-fighting projects around the world. Less than 10% of their resources go toward administrative and fundraising costs. In addition every $1 that CARE receives in private support in turn helps to secure an additional $4 in donated supplies, government grants, and other monies from international, institutional donors. Densen Audio Technologies new top of the line B-275 Superleggera preamplifier (£6800) is the culmination of years of research and fine-tuning. Densen has always given careful attention to the power supplies of their products, and as such the company uses their own power supply capacitors designed specifically for the circuits they are being used within. Within the power supply itself resides many purpose-built separate supplies, focusing on clean power to all stages of the B-275. The transformers are custom-made and most of them are encapsulated in epoxy to minimize vibrations. The power supply of the B-275 is placed in a cabinet named 2NRG. 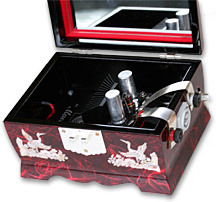 The 2NRG contains no less than three custom-made transformers, each with two separate windings. Each audio channel of the B-275 Superleggera has its own transformer and no less than 200.000uF and rectifying by the use of ultrafast and precise diodes. The third transformer supplies the microprocessor, display, input selectors and the advance relay driven volume attenuator. All in all the 2NRG has no less than 510.000uF in the form of 51 custom-made capacitors. As the first 'Superleggera' product from Densen, weight reduction is also part of the design. The B-275 Superleggera uses Densen's unique non-feedback single-ended Class A topology while an advanced microprocessor controls the attenuator. The attenuator is implemented with the use of Vishay 0.1% laser trimmed metal film resistors, thereby providing extremely accurate tracking and channel to channel balance accuracy. Optional boards include boards that expands the B-275 to a true 7+1 channel analogue preamplifier. Another option is to convert one of the inputs to handle either MM or MC RIAA input phonostage. 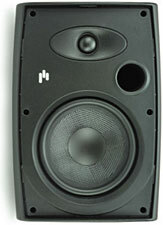 Dali, which stands for Danish Audiophile Loudspeaker Industries, is now selling their Fazon Sat small two-way monitor. Fazon gets it's name due to the association to the Danish and French word "facon", meaning "shape". This compact loudspeaker is targeted to everyone who enjoys music and movies and will appeal to those who seeks a convenient lifestyle solution with high performance and true hi-fi sound in a very small package. This two-way design uses a 1.1-inch soft dome tweeter with a powerful neodymium magnet system and 4.5-inch midrange/woofer with wood fiber cone. Equipped with a 360 degree adjustable pivoting bracket, the Dali Fazon Sat offers a highly flexible and easy to mount "Twist 'n' Tilt" function. Connecting the loudspeaker cable is done quickly in the base of the wall bracket/table stand. The elegant curved cabinet body is a combination of high gloss lacquered aluminum and composite material for the baffle. The surface of the baffle is treated with a rubbery coating. Frequency response is from 86 Hz to 25 kHz, 86dB/W/m sensitivity and presents a 6 Ohm load. Dimensions are 10 x 5.5 x 4.9 [HxWxD in inches] and each units weighs just over 5 lbs. Each unit is available in black or white high gloss lacquer. 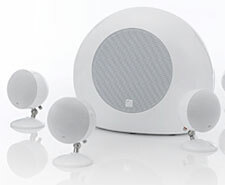 Loudspeaker manufacturer Morel spherical SoundSpot Music Theatre 5.1 speaker system ($1300) is very compact and stylish. Morel made its sphere satellite speakers strong and lightweight by using advanced metal processing. With tough casement walls that are only 1mm thin, the spherical enclosure provides space for the preservation of valuable internal volume. Each SP-1 satellite is 4.3 inches in diameter and weighs only 2.3 pounds, yet holds a 3.5-inch point source woofer and 0.5-inch soft dome tweeter with a liquid-cooled voice coil. The SoundSub PSW8 8-inch powered subwoofer includes a 100 watt amplifier all housed within a rounded footprint fiberglass resin cabinet. Marantz America, a company committed to upholding the tradition of technological superiority initiated by founder Saul Marantz, is expanding its line of advanced Blu-ray players to include four Profile 2.0 models, all with Ethernet connectivity and features to increase flexibility in both playback and installation. Leading the new lineup is the company's highly anticipated flagship player, the ultimate-quality UD9004 ($6000, pictured), joined by the high-end universal UD8004 and two high-value, high-performance players, the BD7004 and BD5004 ($2200, $800 and $550 respectively). Audiophiles will be interested in the Marantz flagship UD9004, as it represents the company's current pinnacle of home entertainment audio and video reproduction. Built using the highest quality materials and craftsmanship to virtually eliminate mechanical distortion, the UD9004's extensively braced chassis features a thick bottom plate with machine milled copper feet, sustaining mechanical stability and therefore sound quality. The Profile 2.0 UD9004 will play virtually any 12cm digital audio or digital video disc ever created, including CD, SACD, DVD-Audio and of course Blu-ray. The unit's dedicated audio section, which is based on the award-winning Marantz SA-7S1 SACD player, ensures superior audio playback at all times and from all sources. Notably, two Sharc Digital Signal Processors (DSPs) are included for the ultimate in HD Audio decoding, and SACD playback is enhanced through the use of Marantz's HDAM technology, Hyper Dynamic Amp module. Audiophiles will also appreciate the 32-bit floating point type Analog Devices DSP for the purest audio imaginable, with four separate circuit boards and a pure direct mode that even shuts down the video playing elements to deliver exceptional, focused audio output when desired. Dual HDMI outputs add to the UD9004's perfectionist-level performance capabilities, and are user selectable for the purest audio and video signal transmission via separate HDMI connections. For unsurpassed picture quality, the UD9004 incorporates 36-bit Deep Color and a leading-edge 10-bit Silicon Optix Realta chipset, with a 297MHz/14-bit Video DAC. Other features include internal decoding of Dolby True HD and DTS HD Master Audio, 7.1 analog outputs including balanced outputs (XLR) for the left and right channels, a copper-encased Toroidal Power Transformer, short signal paths and extensive shielding. For maximum flexibility in convenience and installation, the unit also features an SD card reader, an RS232C interface and an Ethernet connection for BD-Live content and future software updates. Enjoy the Music.com has reviewed the Marantz CD5001 CD player (click here) and Marantz SA8003 SACD player (click here). 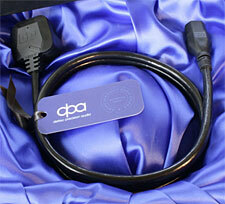 Deltec Precision Audio has just launched their Power InSlink power cable (£140 inc VAT and delivery in the UK). The goal of this new cable was achieved, according to the company, through radical design, engineering excellence and precision manufacturing. Deltec Precision Audio says the problem is that all electrical and electronic appliances generate RF noise in the form of transient spikes, bursts of varying duration and continuous tone or data transmission. These signals also interact with each other causing additional intermodulation products in the audio band. The Deltec Precision Audio's Power InSlink solution is a cable with connector and plug that in combination reduces unwanted RF noise. It achieves this using a special high quality ferrite powder mixed with a polymer compound to produce a dielectric coating that converts RF interference energy into heat. This special dielectric coating is extruded over the copper cores to produce a continuous layer along the entire cable length and then the cores are insulated with a PVC jacket. Additionally, the three cores are wrapped and covered by a shield to provide further immunity to induced RF noise from the outside environment that pollutes the cleaned mains signal. Power InSlink is manufactured from 1.5 meters of Power Slink cable with a BS1363 non-rewireable UK mains plug, with each conductor crimped ensure an excellent connection. The cable is terminated with a molded female IEC connector with using similar crimped terminations. Enjoy the Music.com's August editions of Superior Audio and the Review Magazine are now available! August's Superior Audio has six new reviews, with five being World or North American Premieres! The sound of silence and sweetness. Of love found and love lost. It is indeed all about balance. Colorful and rich in tonal quality. See the August / September 2009 edition of Superior Audio by clicking here. Daily News: Audiophile news updated each weekday! In This Issue.... A time to remember an old friend. Article By Dr. James Howenstine, MD. Giving full range drivers the design attention they deserve. Rooms and racks contribute more than you may think. Bringing tube magic to your home theater room. Honest, pure and allows the music to flow unmolested. Not only a World Premiere, it is the first one in North America! I love them to bits! A studio recording from Telarc, and a concert performance inaugurating the new Boston Classics label. Early chamber music from Handel, in crisp performances with superb sound. Jazz, Folk, Bluegrass, Blues, Etc. See the August 2009 Review Magazine by clicking here.